The American cockroach is reddish-brown in color and the adult males and females develop wings, although they are not good fliers. American cockroaches also live mostly outside, occasionally making their way indoors through small interior cracks and crevices or improperly fitted door thresholds. Like Oriental roaches, American roaches are sometimes also called “water bugs” based on their preference for damp environments near water pipes, drains and sewer systems. In commercial establishments, such as restaurants and grocery stores, American Cockroaches may infest food-storage and food preparation locations. American roaches may venture indoors during changes in weather or when outdoor food sources become scarce. American cockroaches prefer to feed on decaying organic matter such as leaves, trash and yard debris. 6 days. Each egg case (ootheca) contains 16 eggs. The average female American cockroach can produce 21 oothecae (egg cases) over its lifetime. As you can see, all it takes is one pregnant female cockroach to start a cockroach problem and due to the prolific breeding a cockroach infestation can seemingly appear overnight. AmeriGuard Pest Defense will perform a thorough visual inspection to identify the severity of your American cockroach problem. During the inspection, all sources of the infestation will be identified and methods of cockroach treatment will be discussed. The technician will also point out potential American cockroach harborages and suggest mechanical methods of cockroach control. A successful cockroach control service depends on the cooperation of our customers. What Can You Do to Get Rid of American Roaches? Reduce harborages by ridding the surrounding areas of potential food sources. Clean up piles of yard debris and organic matter. Keep trash receptacles tightly sealed. Seal entrances, especially around doors and windows. Ensure that there are no cracks and crevices that would provide an entry to cockroaches. Doorsweeps and thresholds should be properly fitted to prevent cockroach entry. Contact your pest professionals at AmeriGuard Pest Defense as soon as you see evidence of cockroaches. For every cockroach you see, there are several others that you do not. Contact your cockroach service experts at AmeriGuard Pest Defense for a cockroach treatment quote. Most quotes for residential cockroach services can be provided over the phone without any obligation. 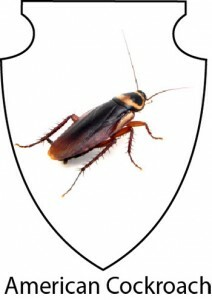 Catching a German cockroach infestation early will ensure that the cockroach problem is taken care of quickly and efficiently by your cockroach experts at AmeriGuard Pest Defense. American cockroaches are considered a General Pest, which are covered under a Monthly, or Bi-Monthly Pest Control Service.